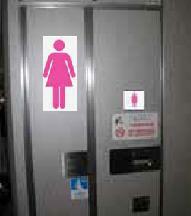 Japanese airline All Nippon Airways will now have a "women only" lavatory on their international flights. A survey among their female travelers showed that 90% wanted a toilet accessible only by women. This has already been implemented by Korean Air. I'd say I now want a "men only" lavatory. It always seem to stink more when I use an airplane toilet after a woman has been using it.